Skin irregularities, like tags, ruby points, milia, and cholesterol deposits under the eyes, are too often a source of frustration. Instead of trying to hide them or diminish their appearance, get rid of them with VascuLyse 2G skin treatment at SKINS Derma Care! 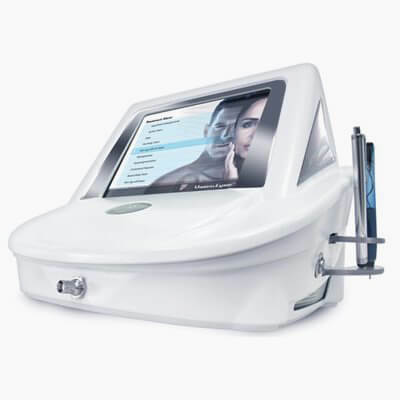 VascuLyse offers safe, non-invasive, and permanent results that let you embrace clear, beautiful skin with confidence. If you’re frustrated with calcium deposits (sometimes known as milia), cholesterol deposits, ruby points/cherry angiomas, keratoses, skin tags, and even spider veins, there is a solution. VascuLyse 2G treatment at your Ottawa laser clinic is a safe, effective, and entirely non-invasive treatment to permanently address these unsightly frustrations. VascuLyse 2G uses an RF current generating heat energy to trigger thermocoagulation in targeted tissues. In short, it raises the temperature of the blood in capillaries, causing them to coagulate and break down, in turn leading to the eradication of common skin issues. Treatment is fast, safe, and above all permanent. How long do treatments typically take? Treatments last 20 minutes at most, depending on the condition being treated and treatment area. Most conditions take between 1 and 3 treatment sessions to resolve completely. Yes! VascuLyse treatment successfully removes these all-too-frustrating skin issues. While it will not prevent additional skin issues, you will not see a recurrence in the treated area. Treatment is extremely comfortable. Some patients report a very mild stinging sensation, though this can be mitigated with topical creams and gels for sensitive patients. VascuLyse does not cause any visible scarring as it only treats the uppermost layers of skin. Most patients experience mild redness in the treated area, but these vanish after the first treatment.